Like each generation before them, millennials are making their way in the world with their own set of ideals, values, and professional goals. Millennials want more than just a six-figure income when it comes to their careers. Today’s young professionals desire a positive work-life balance, flexible hours, and a comfortable, well-designed, inspirational work environment. So, what exactly is it about the millennial-approved workplace that’s driving today’s office design trends? In short: comfortable, collaborative, deliberately designed workspaces that foster creativity and make employees feel right at home. Millennials want an office that doesn’t feel like an office, but rather an extension of their personalities — with just the right balance of social and professional vibes. Millennials are quite literally breaking down the cold, gray, cubicle walls of past generations’ office spaces and opting for a more casual, collaborative environment. This means open spaces that feel more like living rooms than offices, where coworkers can get together for meetings, to brainstorm, or eat lunch while still being productive. Movable furniture is essential in the millennial workplace, so you can pull up a comfy chair and join the discussion. Spaces that make use of natural elements like daylight, wood flooring, and natural brick offer an aesthetically pleasing, cozy environment. When the office space doesn’t feel like a cold, sterile place to work, creativity flows freely and productivity improves. Biophilic design means a connection to nature. We’ve already seen a design trend of plants and living walls of greenery in millennials’ homes; so naturally, young professionals want to connect with nature in their offices as well. Creating a biophilic office space taps into our innate desire as human beings to coexist with nature. 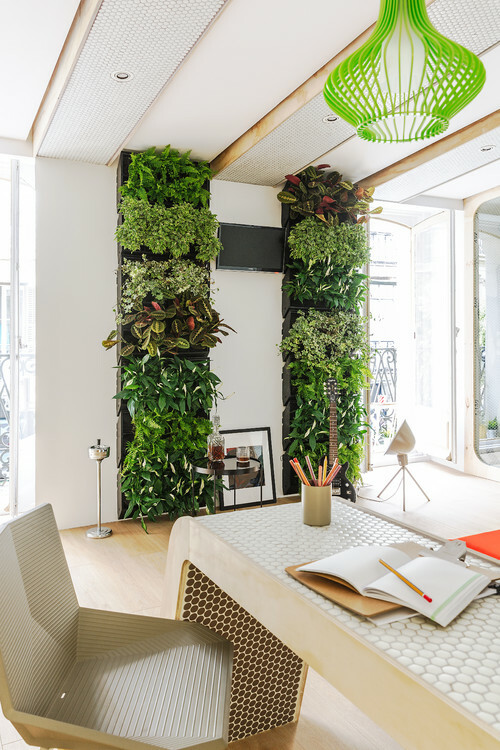 Incorporating a living wall of greenery into an office space brings the outdoors in, purifies the air, and fosters productivity and wellness among employees. Bonus: employees who work alongside living plants call in sick less than their counterparts who work in dreary cubicles. Office space should reflect the portability of today’s technology. Laptops, tablets, and smartphones make it possible to work from anywhere, and that’s just where millennials want to work — wherever it’s most comfortable at the moment. Whether it’s standing desks, couches, or beanbag chairs, today’s professionals are mobile. Offices spaces should reflect that, providing private work areas as well as common spaces where you can take your work with you and still be productive. Portable whiteboards and moveable partitions are a great way to transform open areas into impromptu brainstorming meeting “rooms.” Bright colors add a cheerful element, as millennials rate “workplace happiness” high on their list of professional priorities. 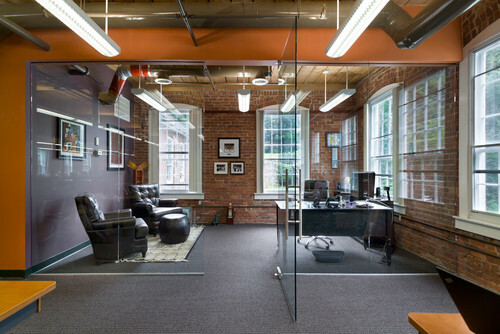 Glass partitions keep office spaces open and inviting. The boss may still have the corner office, but when the interior walls are made of glass instead of plaster, it sends a warm, inviting message to those on the other side. A glass-walled office is on par with the collaborative, friendly undercurrent millennials like at their workplace. This type of office design provides a private space, but doesn’t close off the top dog from the rest of the team. It also incorporates other essential elements like natural light, warm colors, casual furniture, and natural brick. Millennials like to find their zen in the workplace. And who wouldn’t? Modern office design attracts and maintains happy employees by helping to keep their minds focused and their bodies balanced. One way to do this is to deliberately design a space for meditation, yoga, or exercise. Sure, ping-pong tables are fun, too, but balancing upbeat activities and “play” spaces with a yoga or meditation room is a wonderful way to help employees decompress and relax after intense meetings or demanding projects. Ready to revamp an office space that attracts top talent and fosters a positive mood and promotes creative problem-solving? The expert commercial design team at Primera is here to help. Click here to schedule an appointment with a design professional to start your millennial-approved office transformation.